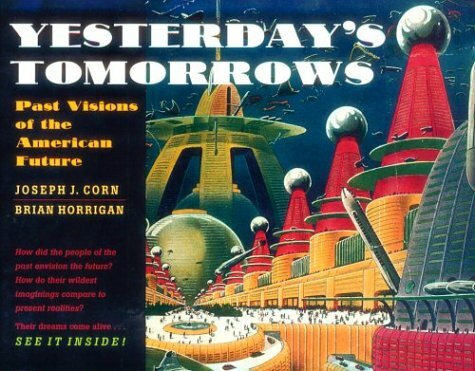 My friend Brian Horrigan, co-author of the retro-futurism bible Yesterday's Tomorrows, writes a blog for the Minnesota Historical Society called Covering 1968. 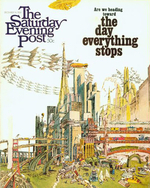 Brian recently blogged about the cover of the December 14, 1968 Saturday Evening Post. Its headline, "Are We Heading Toward the Day Everything Stops?" is an odd juxtaposition against the colorful (though certainly crowded) world depicted by illustrator Gene Holtan. As Brian notes, the illustration style pays homage to popular futuristic images of the late 19th and early 20th century, like this one from an 1895 issue of Judge magazine. An excerpt from Brian's post appears below. If you live in the Twin Cities and don't yet have plans for Groundhog Day (I realize this is a very busy holiday for people) come to the Turf Club in St. Paul where Brian Horrigan and myself will be talking (and drinking) at the Minnesota Historical Society event, The History of Hip: Yesterday's Tomorrows.